A baked potato, a fresh apple, burrito, bread, steamed rice, pizza ... breakfast is different all around the world. But one thing is common. It is sharing! Sharing involves fractions. Let's find out with families having breakfast around the world. 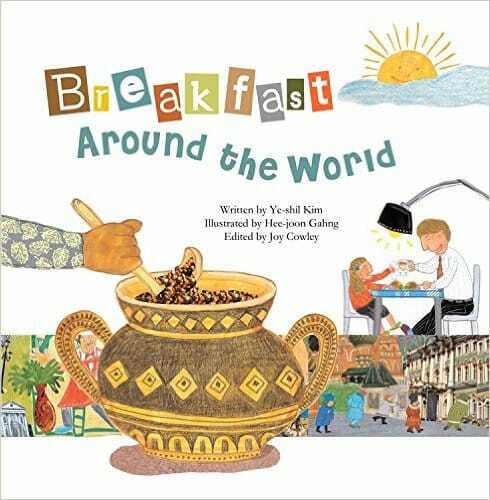 Ye-Shil Kim’s ‘Breakfast around the World’ is part of the world’s largest mathematical story picture book series, called TanTan Math Story (70+ titles). The English translation of this original South Korean version was done in 2015. Different kinds of breakfast had by different families in London, Mexico City, Moscow, Seoul, Rome and Cairo are shown, and they are shared by a different number of people within each family. For example, a family of two in London share jacket potato, a family of three in Mexico City share burrito, etc. The storyline (if any) is weak and somewhat uninspiring. At least, the diversity theme is valuable, and the page illustrations showing the different breakfasts being divided are useful for learning about fractions visually. Like most titles in this series, the book comes with a few mathematical word problems relating to the story to be solved at the end of the story. All in all, there are better story options than ‘Breakfast around the World’ that can be used to introduce the concept of fractions to children aged 5+ years old.